The US Bureau of Ocean Energy and Management (BOEM) has released the Draft Programmatic Environmental Impact Statement that is the first step toward oil and gas development off the east coast. The PEIS assesses the impacts of geological and geophysical (G&G) activities, primarily seismic surveys and test wells. 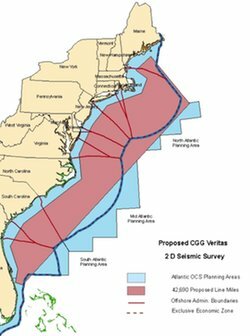 I’ve yet to dig into the PEIS to examine its alternatives or proposed mitigation measures, but a quick look at maps illustrating applications already received from oil and gas exploration companies affirms that the entire east coast could become an active seismic survey zone (the map at left is one of nine applications; there is much overlap among them). While very few animals are killed or injured by air gun sounds, behavior can be affected for tens of miles, and airgun sound can be heard (and so drown out some distant communication) for hundreds of miles. I just returned from a BOEM workshop on the effects of ocean noise on fishes and invertebrates, where scientists shared research on reduced fish catch rates near surveys (the fish move away for a few days or weeks, then gradually return), and attempted to come up with a shared understanding of how to investigate whether ocean noise can affect fish communication, larval or egg development, or other aspects of ocean ecology (so far, there is little direct evidence of impacts, but some concern remains about masking of sounds fish use for many purposes, and the possible negative stress impacts of chronic noise exposure). From looking at the maps of existing applications to do surveys (download pdf of rough maps of all 9 applications), it’s immediately apparent that BOEM could work to minimize duplicating of efforts by several companies. It may be that there will be areas that are clearly inappropriate for oil and gas development (eg, key fishing grounds or other biologically important areas), or seasonal exclusions to reduce impacts on spawning or migration. Of course, there’s also the bigger-picture climate change question of whether we really want to be continuing to pull more oil and gas from the ocean in the years after 2020 anyway; any new leases will be issued after 2017, with development following years later. Meanwhile, BOEM is working hard to lay the groundwork for renewable energy development in offshore waters, targeting areas for wind, tidal, and wave energy systems. For now, continuing to plan for oil and gas development is part of the Obama administration’s “all of the above” approach to meeting America’s future energy needs. For more on the Draft PEIS, see BOEM’s PEIS website, which includes links to download the documents and submit comments, this press release from the Department of the Interior, and this blog post from NRDC (which stresses that quieter alternative technologies for oil and gas exploration are expected to be commercially available in 3-5 years). It becoming quite clear(research and testing) that the high pressure natural gas lines running everywhere, are emanating ILFN causing the strange hum phenomena and impacting us and wildlife species.